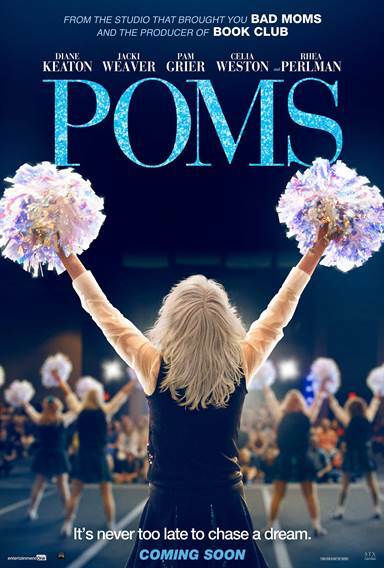 POMS is an uplifting comedy about Martha (played by Diane Keaton), a woman who moves into a retirement community and starts a cheerleading squad with her fellow residents, Sheryl (Jacki Weaver), Olive (Pam Grier) and Alice (Rhea Perlman), proving that it's never too late to follow your dreams. Celia Weston, Phyllis Somerville, Charli Tahan, Alisha Boe and Bruce McGill also star. Zara Hayes directed the script by Shane Atkinson. Producing are Kelly McCormick (Atomic Blonde); Alex Saks (Book Club); Mad as Birds Films' Andy Evans, Ade Shannon, Celyn Jones, Sean Marley and Rose Ganguzza. Keaton, Sierra/Affinity's Nick Meyer and Marc Schaberg, and Will Greenfield are executive producing. Poms images are © STX Entertainment. All Rights Reserved.